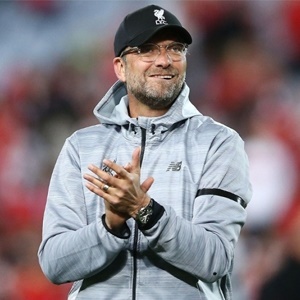 London - After the drudgery of last weekend's goalless stalemate against Manchester United, Liverpool manager Jurgen Klopp is relishing the prospect of Sunday's trip to Wembley to face Tottenham Hotspur. United produced a cautious performance at Anfield last Saturday, limiting Klopp's side to two clear goal-scoring opportunities. Liverpool took their frustrations out on Maribor in the Champions League in mid-week, running in seven unanswered goals against the Slovenian side, and Klopp is excited about going toe-to-toe with Spurs. "I'm really looking forward to this game because you don't have a lot of these games where both teams are going for everything," Klopp told Friday's pre-match press conference. "It's always like that against (Manchester) City and against Tottenham it is like this. "They are in a really good moment as a club and we are the challenger when we go there. That's how it is. But they know it will not be an easy game, so good. Let's play and let's see what happens." Klopp has met with disappointment on his two previous visits to Wembley. It was the scene of his Borussia Dortmund side's loss to Bayern Munich in the 2013 Champions League final and he saw Liverpool beaten on penalties by Manchester City there in the 2016 League Cup final. But the German, whose team trail leaders City by nine points, says he is looking forward to returning to England's national area, describing it as a "good place" and a "wonderful stadium". Tottenham are themselves learning to love Wembley after a difficult start to their season-long tenancy there. After three league games without victory on their new patch, they belatedly broke their duck last weekend as Christian Eriksen's 47th-minute strike secured a 1-0 win over Bournemouth. It kept Spurs in third place in the table, five points below City, and there was further encouragement for manager Mauricio Pochettino in the 1-1 draw away to European champions Real Madrid in mid-week. Pochettino says his team will approach Sunday's match in a similar vein to the game at the Bernabeu -- mindful of their own strengths, but also conscious of the attacking threat posed by the opposition. "We are aware about that, like when you play Real Madrid or this type of team," he told the Spurs website. "We are going to try to keep our philosophy, but always with some different things that you must be focused and aware. "Liverpool have a very good team and unbelievable players. For me it's one of the best squads in the Premier League. "In both phases of the game, both in and out of possession, we need to be very focused on how we need to stop them and how we can develop our game in possession too." Spurs left-back Danny Rose could make his first league appearance in nearly nine months, having made his comeback from as a injury as a substitute in Madrid. But Ben Davies is likely to start ahead of him, having recovered from illness, as Spurs go in search of a first league win over Liverpool in 10 attempts. Dele Alli returns following a Champions League suspension, but fellow midfielders Mousa Dembele (hip) and Victor Wanyama (knee) are both out. With Harry Kane having gone two games without a goal for the first time since August, Liverpool will be wary of a backlash from a player who Klopp describes as "one of the best strikers in the world". Liverpool skipper Jordan Henderson is expected to return to the visitors' starting XI after being rested for the trip to Maribor, despite James Milner impressing as his deputy. Simon Mignolet is also set to return in goal and 20-year-old Joe Gomez will hope to come back into the team at right-back after receiving plaudits for the way he shackled United winger Anthony Martial last weekend. Winger Sadio Mane, midfielder Adam Lallana and full-back Nathaniel Clyne remain sidelined.